In his book, The Design of Business, why design thinking is the next competitive advantage, Roger Martin explores how design thinking can help businesses create long-term advantage and value by building systems that balance the needs of the analytical processes required for efficiently running an organization and the intuitive processes required to help organizations explore and discover new opportunities. Higher education is going through a period of significant change and many of the existing operational models are being disrupted through technological and social changes. Martin’s design of business framework is a helpful concept for colleges and universities seeking to create value and competitive advantage in our changing environment. One of the core ideas Martin explores is how businesses traditionally derive long term value by moving knowledge through what he calls the knowledge funnel. The next stage of the funnel is a heuristic, a rule of thumb that helps narrow the field of inquiry and work the mystery down to a manageable size…It is a way of thinking about the mystery that provides a simplified understanding of it and allows those with access to the heuristic to focus their efforts. As an organization puts its heuristic into operation, studies more, and thinks about it intensely, it can convert from a general rule of thumb (Americans want a quick, convenient, tasty meal) to a fixed formula ( [Ray] Kroc’s totally systematized McDonald’s). That formula is an algorithm, the last of the three stages of the knowledge funnel (pp.7-9). Martin argues that businesses create value by moving knowledge through the knowledge funnel—by exploring mysteries and creating heuristics to help address the mysteries, and by exploiting existing heuristics by transferring them to be algorithms allowing for expansion and economies of scale. “Most often, organizations choose to focus on one activity, either exploration or exploitation, to the exclusion of the other and their own detriment” (p.18). Organizations that focus on exploration will often structure their work around intuitive processes that are able to make intuitive leaps that help a mystery to become a heuristic but will struggle with systemization and scaling and may be disrupted by other organizations that make their heuristic into an algorithm. Organizations that focus on exploitation organize their work around “running an existing heuristic, gently honing and refining it, but not seeking to move knowledge to an algorithm or running an existing algorithm and not seeking to explore the next mystery” (p. 19). Exploitation oriented organizations are at risk of being disrupted by new discoveries or environmental changes that make their algorithm obsolete. Martin offers a third mode of organizational orientation, design thinking, in which organizations embrace both exploration and exploitation activities. “The answer lies in embracing a third form of thinking—design thinking—that helps a company both hone and refine within the existing knowledge stage and generate the leap from state to stage, continuously, in a process I call the design of business” (p. 24). For his definition of design thinking, Martin draws on a definition given by IDEO’s Tim Brown. “design thinking is ‘a discipline that uses the designer’s sensibility and methods to match people’s need with what is technically feasible and what a viable business strategy can convert into customer value and market opportunity'” (p.62). Martin argues that in order for design thinking to thrive in organizations it will require leaders—design thinkers—who are able to balance intuitive discovery processes and the need for analytical decision making. To do their work, design thinkers employ the tools of observation, imagination, and configuration. Through observation, design thinkers develop a deep understanding of the people they hope to serve. With imagination, design thinkers make inferences about what might address people’s needs and through prototyping and user-testing, they refine the idea. In configuration, design thinkers translate their insights and prototypes into the systems that will create the business outcome (pp. 160-163). The design thinker therefore enables the organization to balance exploration and exploitation, invention of business and administration of business, and originality and mastery. Design thinking powers the design of business, the directed movement of a business through the knowledge funnel from mystery to heuristic to algorithm and then the utilization of the resulting efficiencies to tackle the next mystery and the next and the next. The velocity of movement through the knowledge funnel, powered by design thinking, is the most powerful formula for competitive advantage in the twenty-first century (pp. 24-26). Martin argues that building design thinking into an organization will take significant intentionality. Because most organizations are built around analytical logic processes, there will be clashes of culture between design thinking processes and traditional analytical processes. If organizations are to build and benefit from design thinking processes, there is leadership work that will be necessary to make space within the organization for design ways of thinking including how projects are structured, how compensation and prestige is managed, and how leadership makes decisions. To illustrate design thinking in organizations, Martin discusses a number of companies such as Proctor & Gamble, Research In Motion, Target, Hermann Miller, Apple, and Steelcase that have moved to become design thinking oriented business, discussing how design thinking helped these companies create significant value. However, Martin’s criteria for what makes businesses successful in using design thinking is unclear. In particular, Research In Motion, maker of BlackBerry devices and one of Martin’s key example institutions, has lost significant market share in the years since the publication of this book. Additionally, Martin admits to have been personally involved in several of the example organizations. 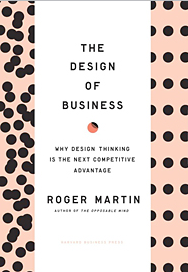 While Martin does not make a case-closed argument for the effectiveness of design thinking, the concept has merit and is worth more exploration. The world is changing for higher education institutions, many schools are finding that their organizational models are being disrupted by technological and social changes. For many, past history will not be an indication of future results. Colleges and universities have often structured their work in the heuristic level of Martin’s funnel, hiring highly skilled and highly paid faculty and administrators to support student learning. In some cases this heuristic level work is being transformed to algorithmic work through technological change that allows schools and organizations to automate many teaching and learning tasks. For-profit schools, online learning, MOOCs, and alternate credentialing systems are a few of the changes making some educational processes much cheaper and are disrupting the operational models of many schools. Martin’s design of business model could be helpful for higher education institutions. Colleges and universities could embrace algorithmic processes, making some teaching and learning work more efficient in order to free up creative and skilled faculty and administrators to tackle new and vexing challenges—to explore new mysteries and create new opportunities through developing new heuristics. The design of business model may help colleges and universities to respond to current disruptive changes by developing organizational systems that are able to discover new possibilities and then help them develop those concepts effectively and efficiently.